Farmhouse Villa Panorama is the ideal place for families with children or groups of friends who want to make their unique holiday in a typical Tuscan farmhouse that has maintained the materials and the design of the late nineteenth century. You will be the only guests. The owners Paola and Franco are always at your disposal just a few steps away from the Villa, in full respect of your privacy. Nestled in the Val di Chiana, in the town of Sinalunga (Siena), in a strategic position just a few kilometers away from the most important centers of art and culture of the Tuscany region like Siena, Chianti, Florence, San Gimignano, Montepulciano, Montalcino, Pienza, Arezzo, Cortona, they are all reachable from the Highway A1 - Valdichiana Bettolle which is only 15 km away. 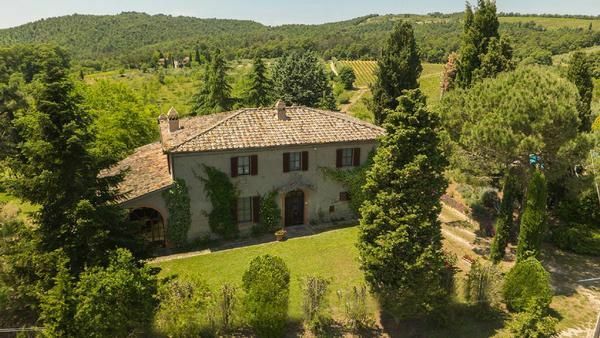 You will feel like the owners of a Tuscan farmhouse, all at your disposal, surrounded by a large garden with a private swimming pool. The farm is spread over two floors covering an area of about 300 square meters, and is suitable for eight people. The main entrance on the ground floor is characterized by a wooden stove typical of the farmhouses in the countryside of Siena and a large Tuscan fireplace in the main hall. The tennis table lounge, large and bright offer a special space called "The wall of guests", that Paola decorates since 1999 with photos of all customers who have realized their dreams of living an unforgettable holiday in Tuscany in the farm Villa Panorama . A bathroom with shower and bath is available on the ground floor. On the first floor, which is accessed by an impressive stone staircase, there are four bedrooms with ceilings made with wooden beams, floors in terracotta, and panoramic views of the most famous city's of art. The two suites room Cortona and room Siena have a private bathroom and a private living room for reading and play. The room Montalcino and the room Pienza have a shared bathroom. In the middle of the garden, on the right side next to the villa, there is the swimming pool surrounded by olive trees. Final cleaning: once per object Costs amounting to 120 EUR (Mandatory). Fuel for chimney/fireplace: per object and day Costs amounting to 40 EUR (optional). Cot (per property and day, included in price 0 EUR). Cot for adults (per property and day, included in price 0 EUR). Intermediate cleaning (per property and day, included in price 15 EUR). Pet (per property and day, included in price 0 EUR).